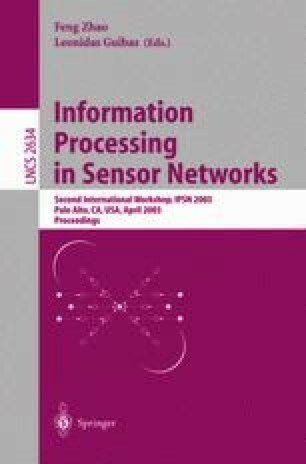 We address the problem of deterministic oversampling of bandlimited sensor fields in a distributed communication-constrained processing environment, where it is desired for a central intelligent unit to reconstruct the sensor field to maximum pointwise accuracy. We show, using a dither-based sampling scheme, that is is possible to accomplish this using minimal inter-sensor communication with the aid of a multitude of low-precision sensors. Furthermore, we show the feasibility of having a flexible tradeoff between the average oversampling rate and the Analog to Digital (A/D) quantization precision per sensor sample with respect to achieving exponential accuracy in the number of bits per Nyquist-period, thereby exposing a key underpinning “conservation of bits” principle. That is, we can distribute the bit budget per Nyquist-period along the amplitude-axis (precision of A/D converter) and space (or time or space-time) using oversampling in an almost arbitrary discrete-valued manner, while retaining the same reconstruction error decay profile. Interestingly this oversampling is possible in a highly localized communication setting, with only nearest-neighbor communication, making it very attractive for dense sensor networks operating under stringent inter-node communication constraints. Finally we show how our scheme incorporates security as a by-product due to the presence of an underlying dither signal which can be used as a natural encryption device for security. The choice of the dither function enhances the security of the network. This research was supported by NSF under grant CCR-0219722 and DARPA under grant F30602-00-2-0538.